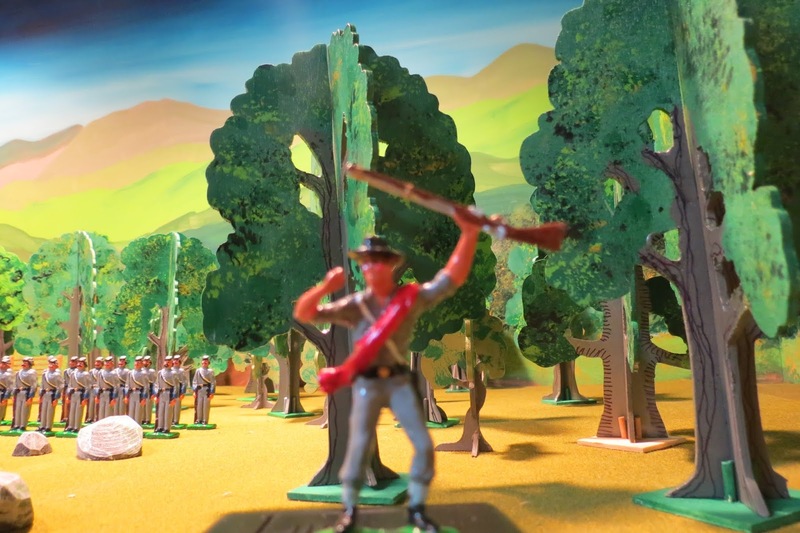 A decisive moment out in the toy soldier studio. This post is about me, and this post is about you. 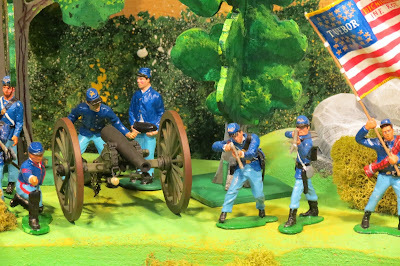 This is also a post about our imagination. 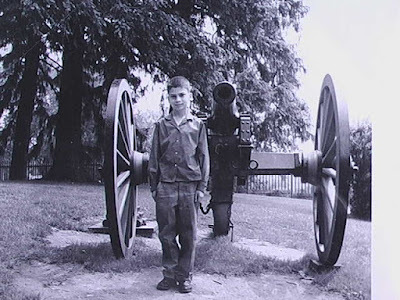 When I was a little kid, two important things happened that changed my life. 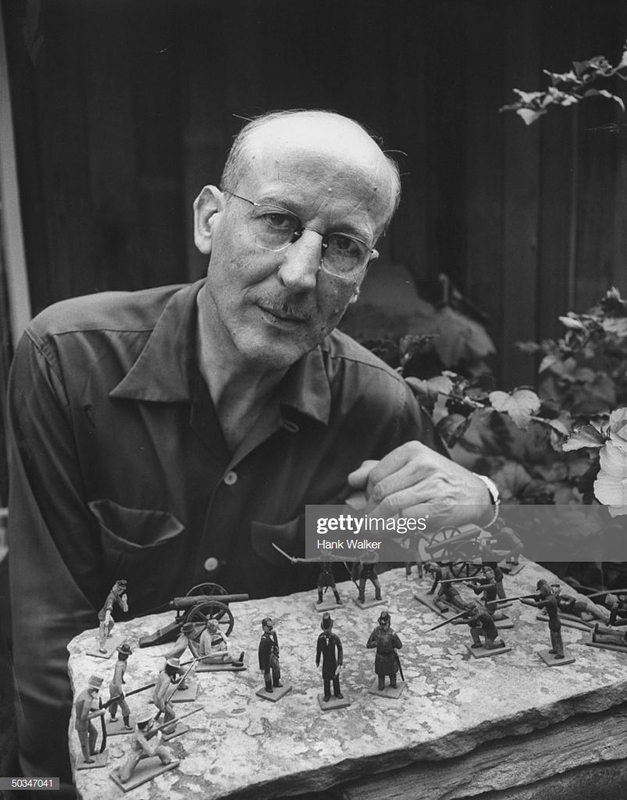 and the other was a letter from famous Civil War writer Bruce Catton. In his letter he said that he'd be sending me a copy of his new book "This Hallowed Ground." 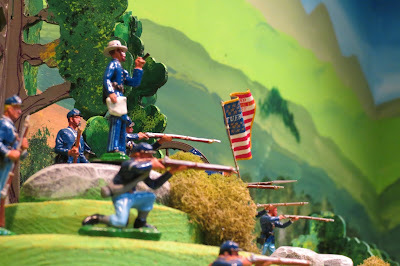 Every day after school I'd ask my mother if my book had come. 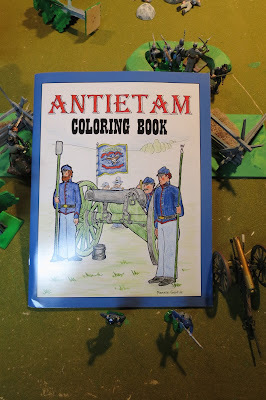 Finally the day came and my book arrived. It was beautiful, and I constantly looked at the pictures and read the captions, often while I was playing with my toy Civil War soldiers. When I was a little kid I was sick a lot and missed school frequently. 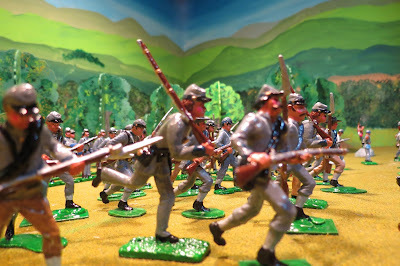 My mother told me about a Scottish writer and Poet named Robert Louis Stevenson, who was my age (ten) during the Civil War. Like me, Robert was sick a lot. 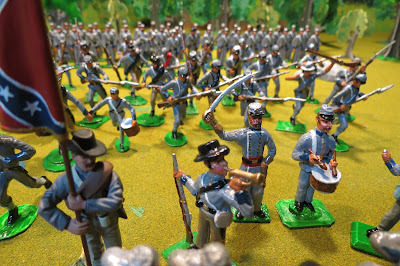 And one of the things that he did while lying in bed was to use his imagination and play with his toy soldiers. 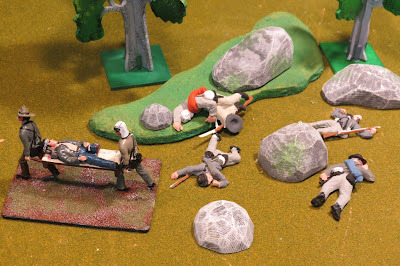 Here I am, sick at home, playing with soldiers and reading the book that Mr. Catton sent me. 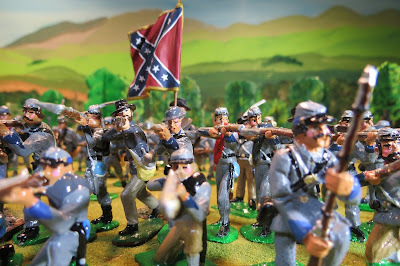 I'm happy to say that I still have that very book, and I still enjoy those pictures. One of the things that I really enjoyed about the book was that Mr. Catton often used toy soldiers to illustrate what he was talking about. 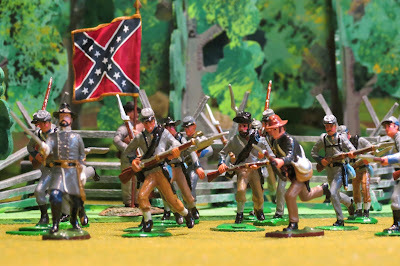 I found these pictures absolutely fascinating...I still do. 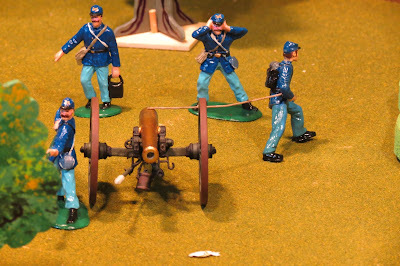 If you zoom in on the picture above you'll see that I have a cannon identical to the one in the picture. 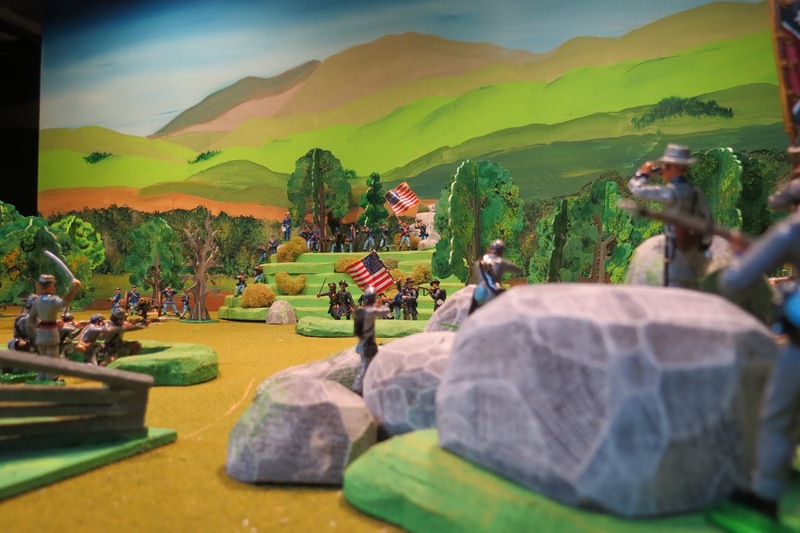 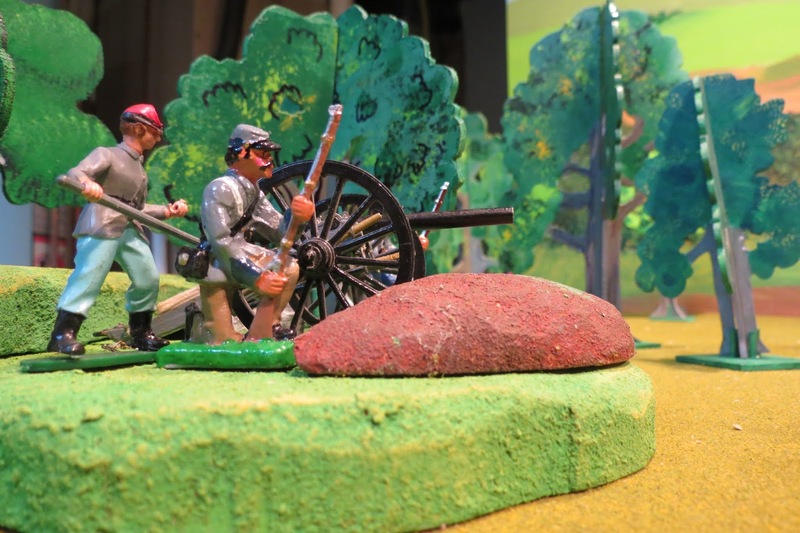 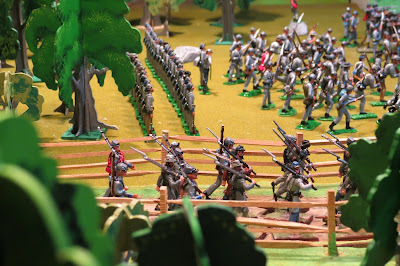 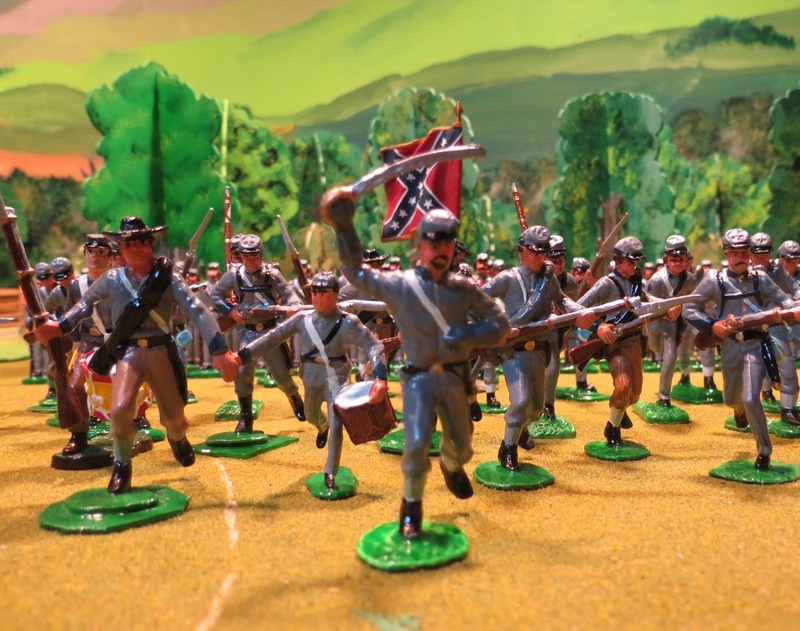 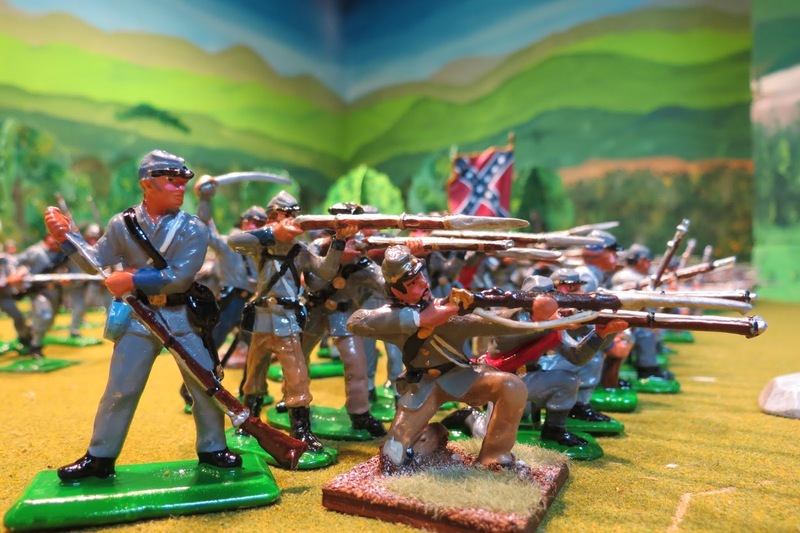 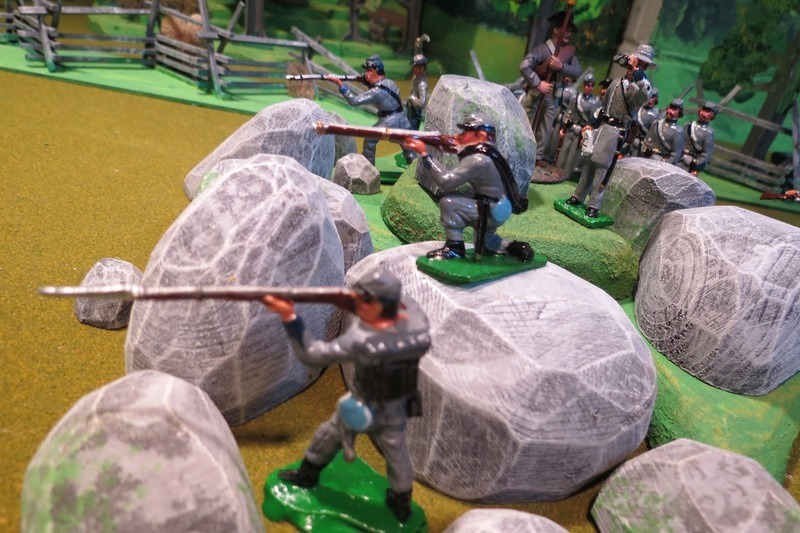 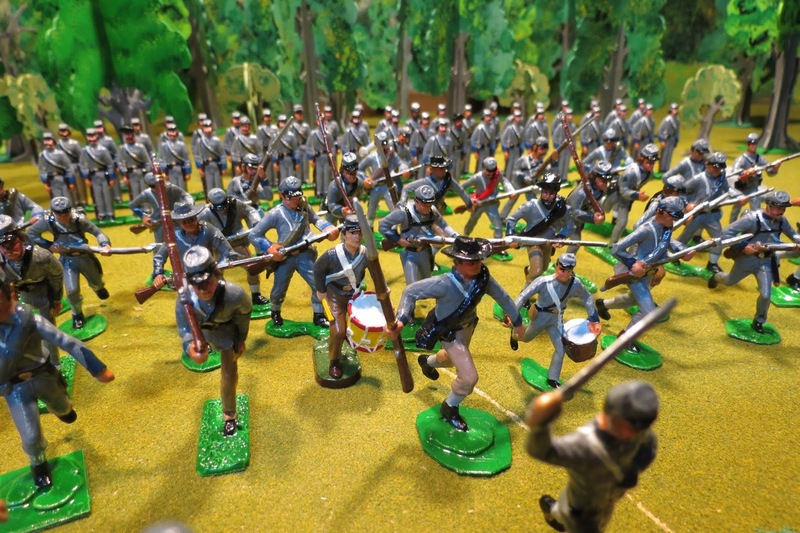 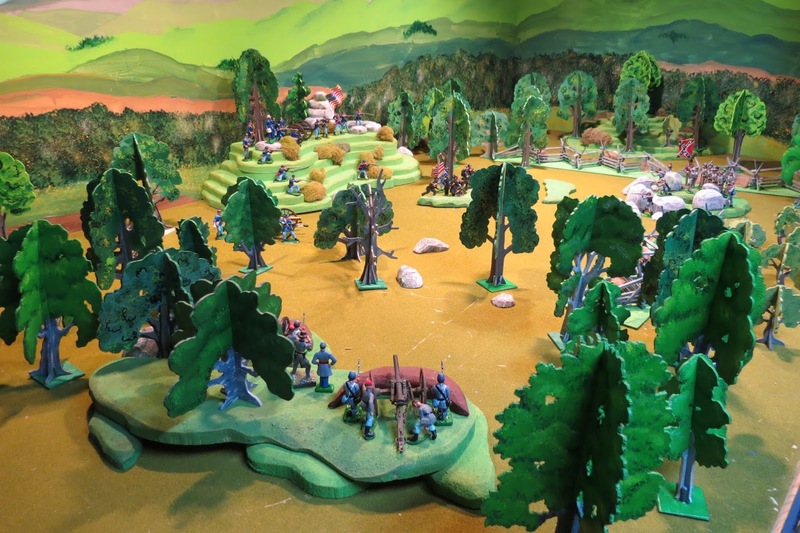 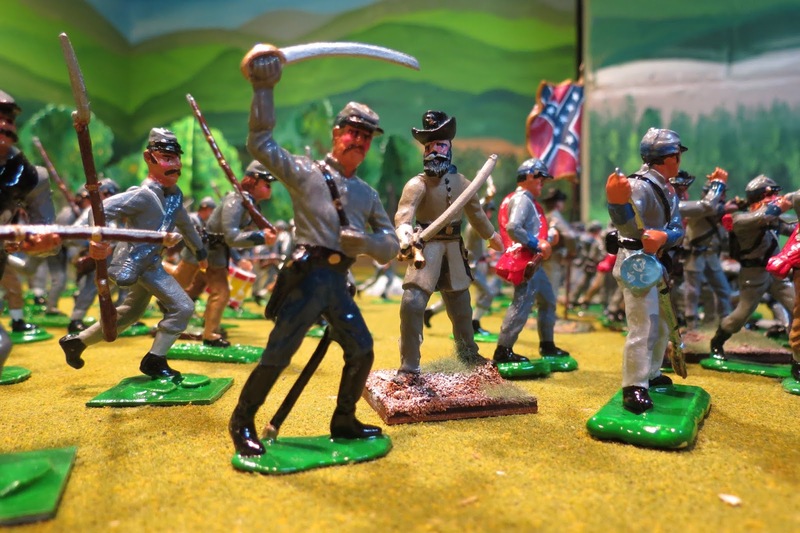 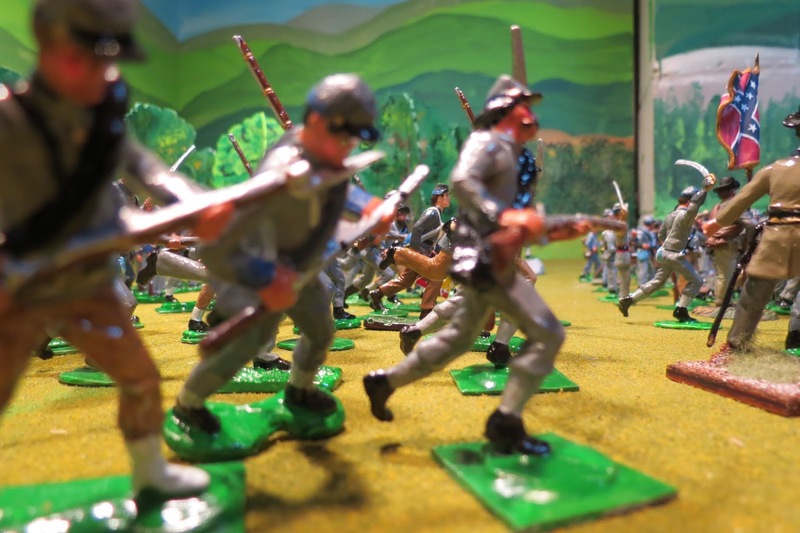 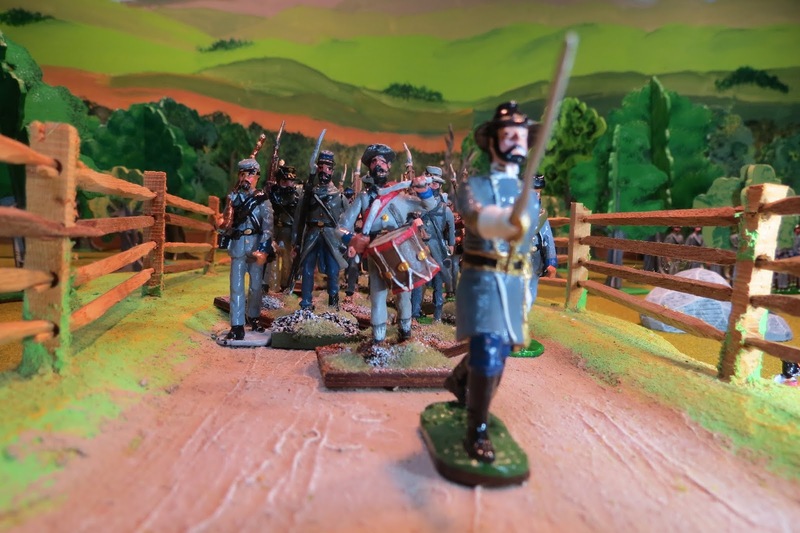 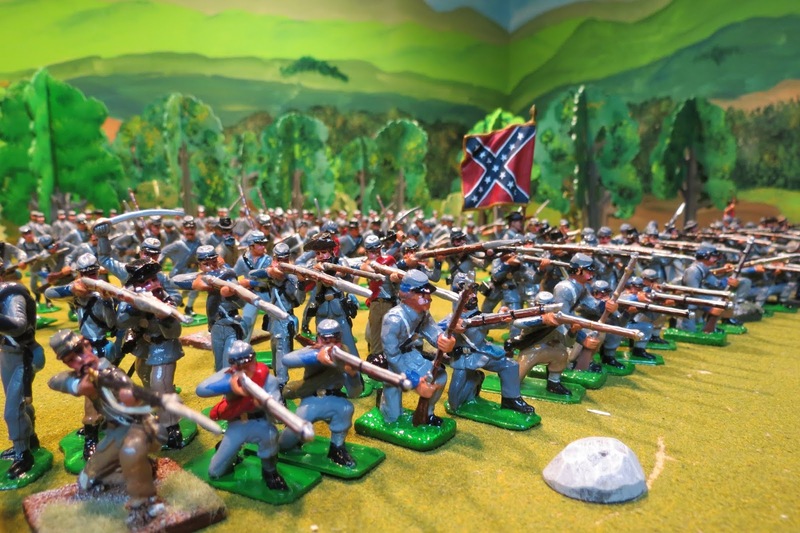 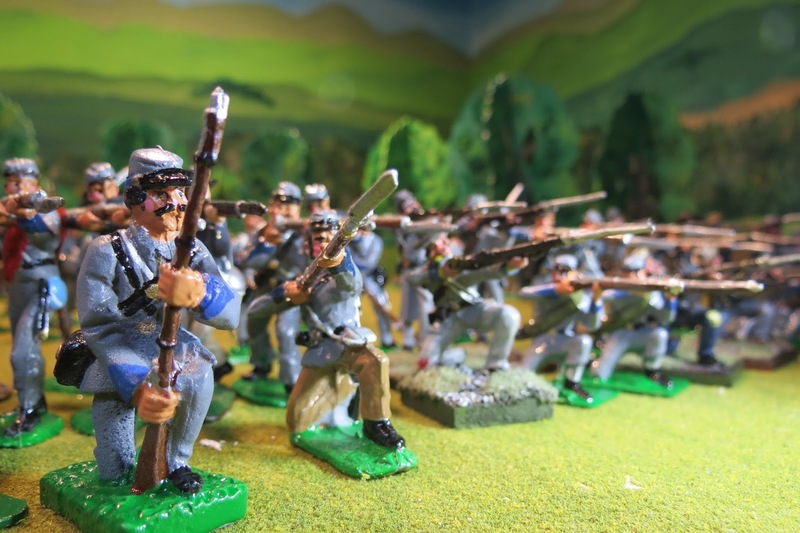 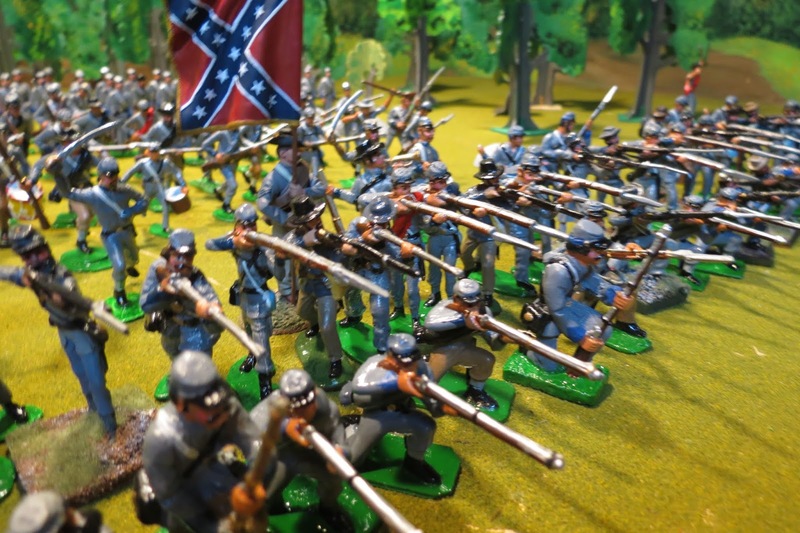 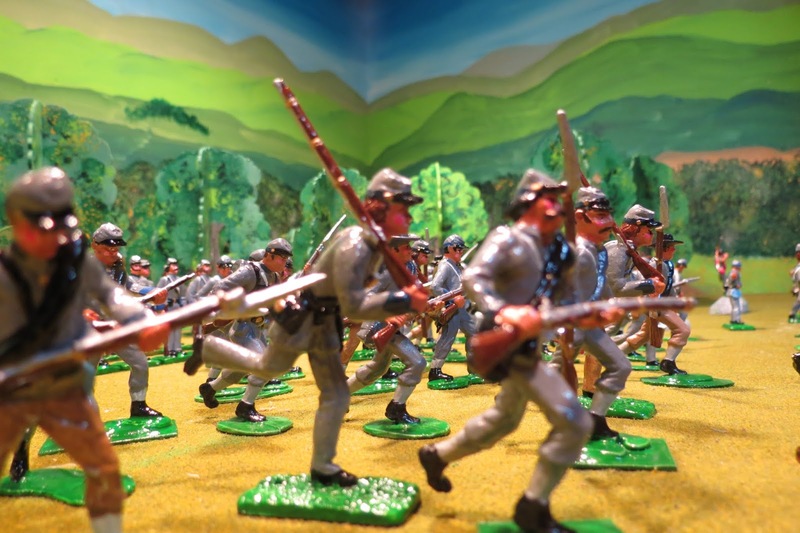 I had been playing with toy soldiers since I was about five-years-old, and when I saw how they could be used to tell a story I became even more excited about setting them up to represent different battles or important moments in those battles. This blog post is intended to spark your imagination on how you can use your soldiers to tell those important stories. 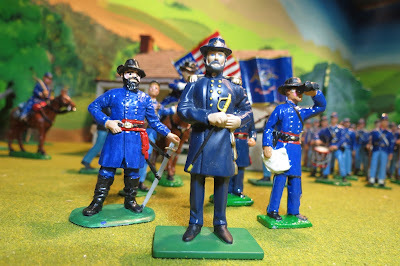 I find that doing this and taking lots of photos for this blog caused me to enjoy the toy soldier hobby even more, and I hope that what I do here helps you to see just how important imagination can be...yours, as well as mine. So here is my latest effort - a small portion of the second day of the three-day Battle of Gettysburg which was fought in early July of 1863. 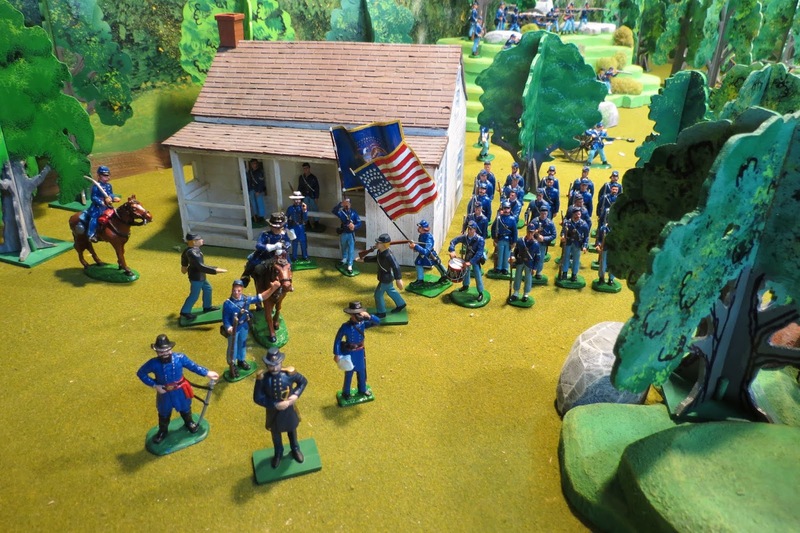 The action takes place in the area of a huge boulder formation called "Devil's Den" and a hill called "Little Round Top." 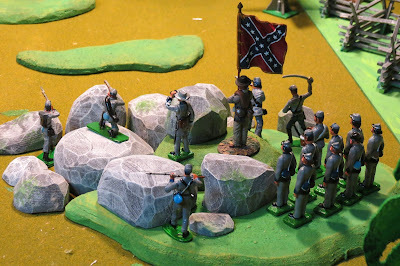 The action here starts as the Confederates, commanded by General Robert E. Lee have taken position of Devil's Den and are firing upon the Union soldiers on Little Round Top. 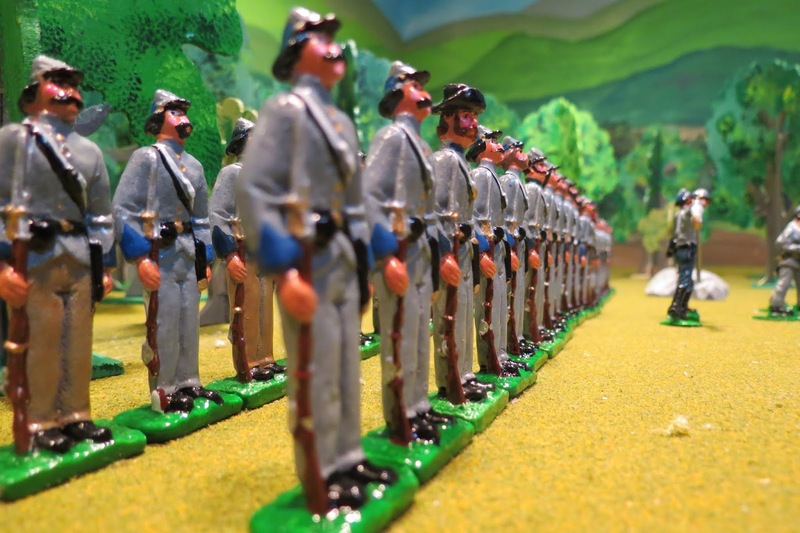 The Union soldiers were commanded by General George Gordon Meade. 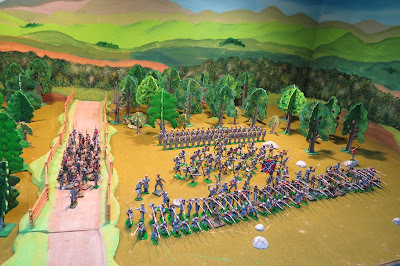 Here comes the battle, a chance for you to use your imagination as you look at the pictures, which you can click on to make them larger. 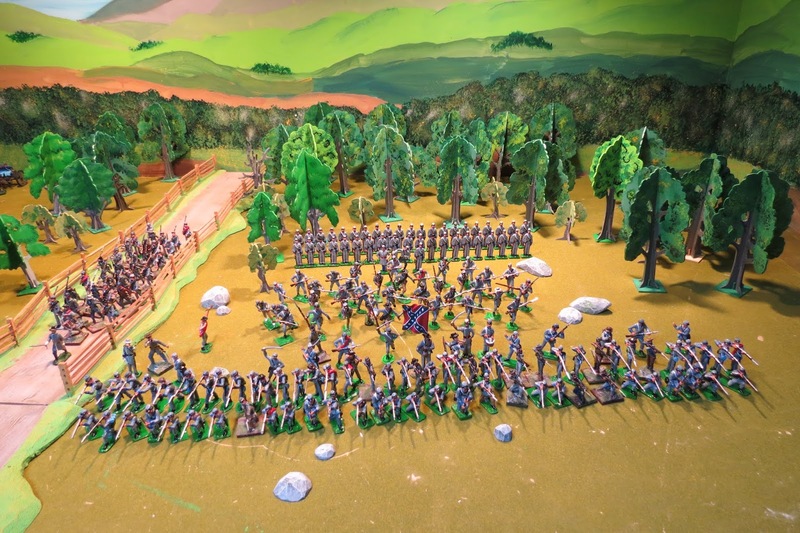 Here's the part of the battlefield we'll be looking at; you might want to zoom in on this photo. Little Round Top is the hill toward the top of the picture. 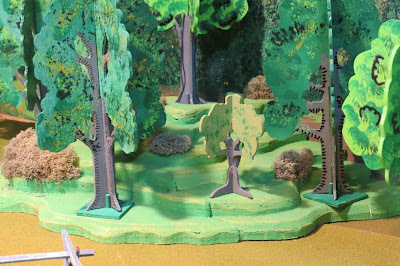 You can see the boulders of Devils Den peeking through the trees to the right. At the bottom of the picture is Oak Hill where the Confederates have seven breech-loading Whitworth cannons which could shoot over five miles! 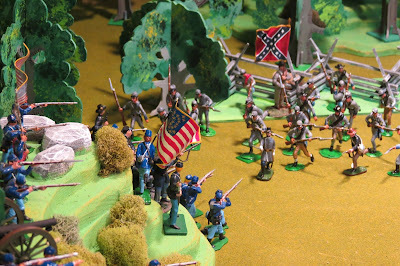 In the distance in the upper right of the photo is the hill named Round Top. 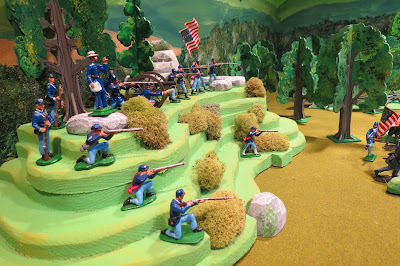 Round Top was higher than its little brother but it was too covered with trees to be used by the Union cannons; so it was unoccupied for most of the three-day battle. In a little white-washed house that was owned by Mrs. Leister, Union General George Gordon Meade set up his headquarters. Robert I. Lee (on the right). 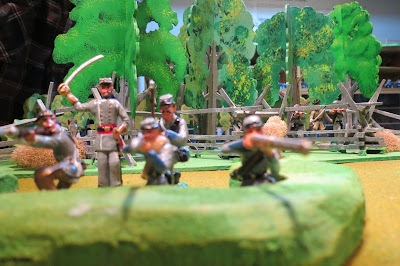 Lee was also a very skilled general and led his Army of Northern Virginia to many victories. This was Lee's second northern invasion, the first was nine months earlier when he crossed the Potomac River into the state of Maryland. 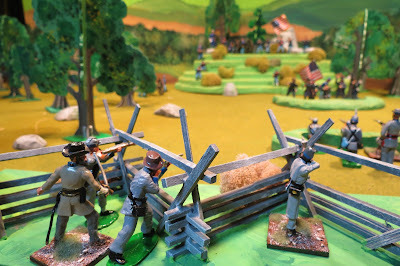 That invasion resulted in the Battle of Antietam, which was a defeat for Lee and forced him to retreat back to Virginia. 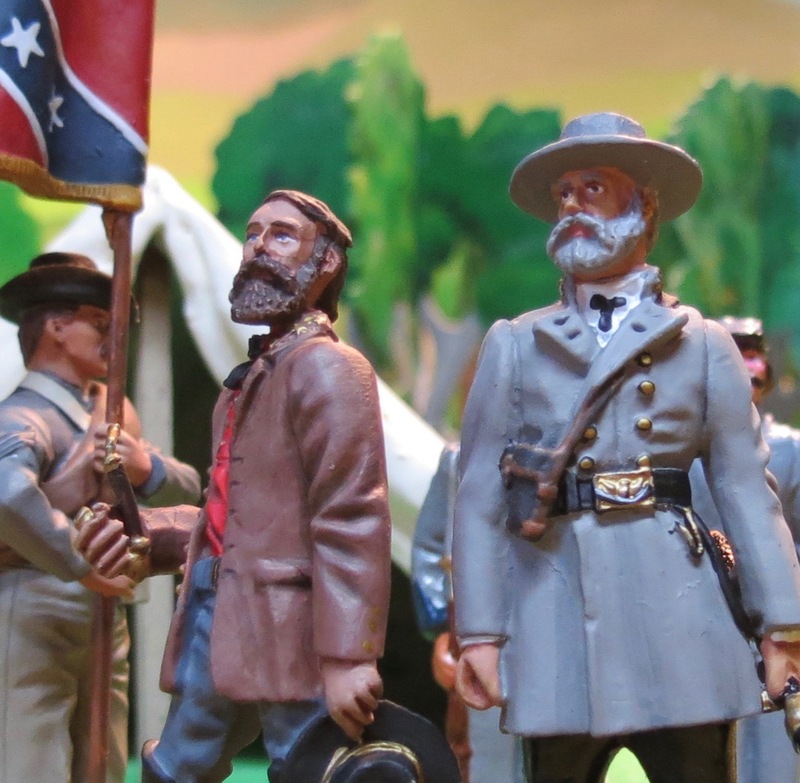 The Union victory helped President Abraham Lincoln to issue the Emancipation Proclamation, which freed enslaved African-Americans. 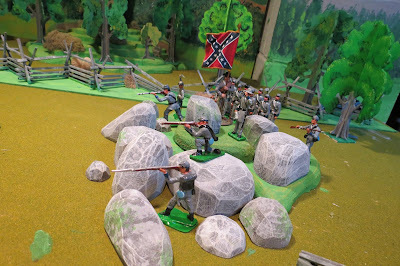 The first two days of the battle had gone pretty well for the Confederates in areas like the Wheatfield and the Peach Orchard...that's the group of small trees in the foreground. One of the main Union regiments fighting in the Peach Orchard was the 3rd Michigan...you can see my post about them here. By the middle of the day the Confederates had occupied the Devil's Den, which was a very strong position. 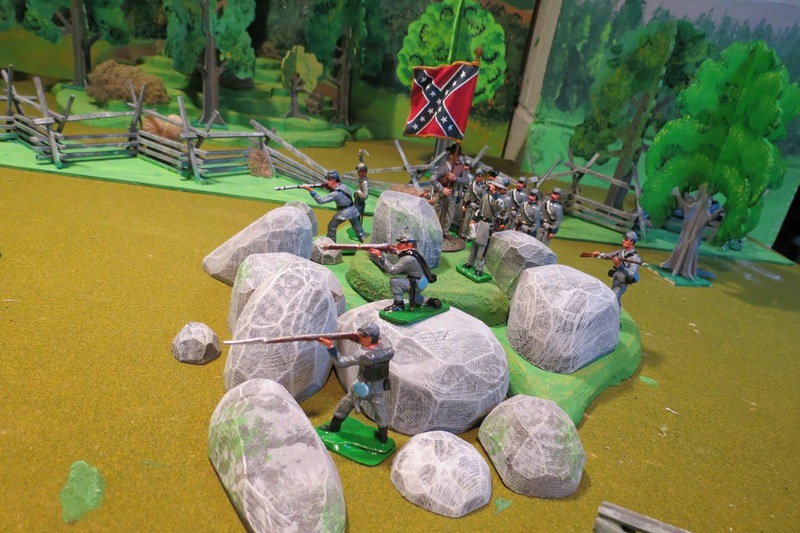 The Confederates in Devil's Den are firing at the Union troops in front of Little Round Top. 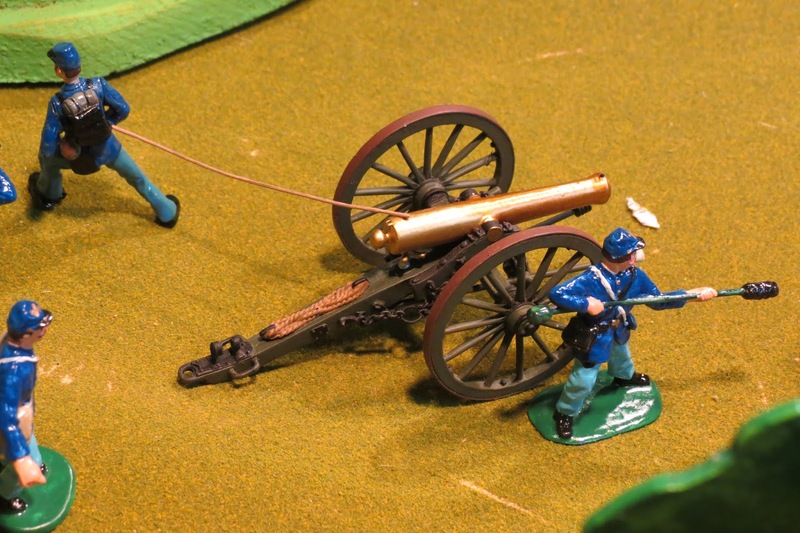 There were also artillery duels going on between the Union and Confederate cannons. 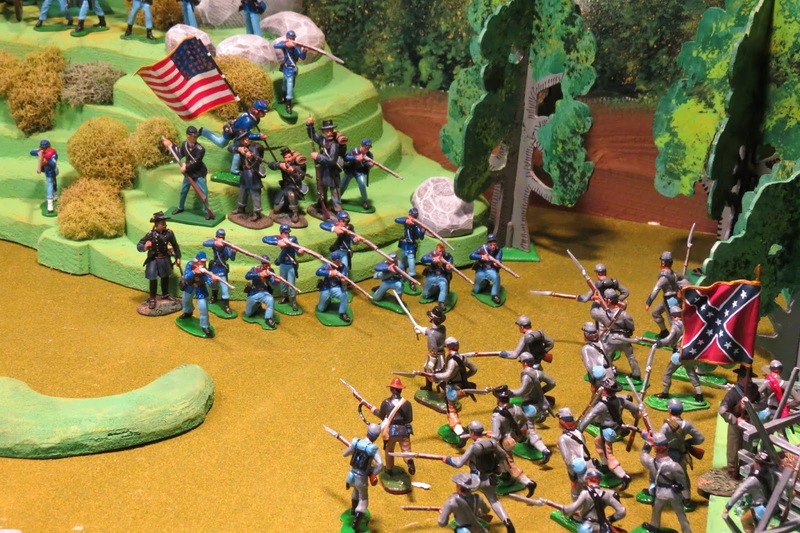 Little Round Top overlooked the field and would have been a very strong position for the Union forces...the trouble was...there were no Union soldiers up there, and the Confederates were advancing to take that key position. 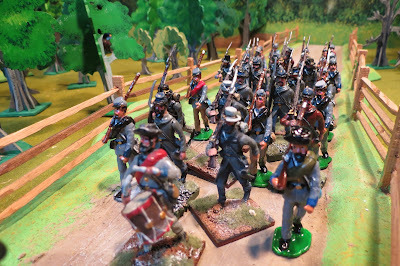 Fortunately for the Union forces, Meade's chief engineer - brigadier general G.K. Warren was on top of the hill and realized the danger. 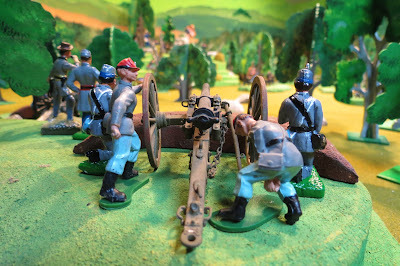 Thinking fast, he went down the back of the hill and found the troops of general Strong Vincent marching by and ordered them to the top of the hill. Just in the nick of time those Union soldiers took up position on Little Round top and started firing at the Confederates. Warren also managed to get some cannons up in that very strong and commanding position. For hours the two sides exchanged fire. 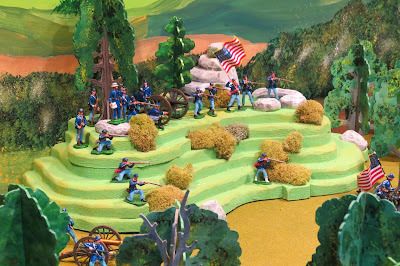 The rebels were using the Devil's Den as a natural fortification and were delivering accurate fire against the yankees on Little Round Top. Finally, to break the stalemate, the Confederates made a charge toward the lightly defended flank of the hill. 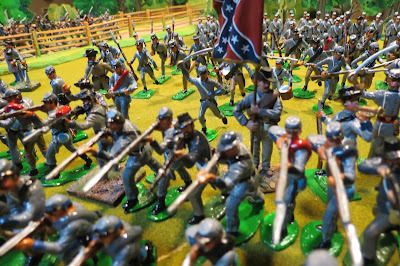 The Confederates were getting closer and closer. 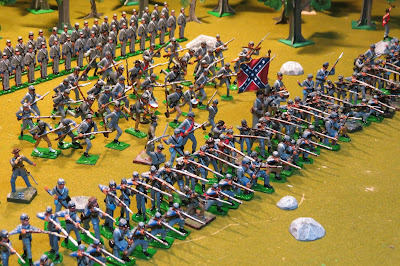 General Vincent saw the threat and shifted Union soldiers to meet the Confederates. The Confederate attack was broken, with many rebels killed or wounded. 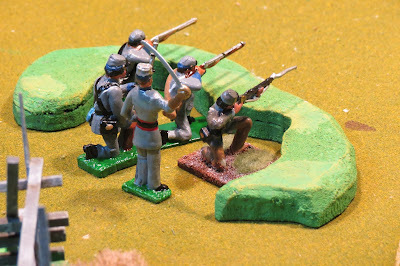 The following day (July 3) Lee made his final desperate charge against the Union line, but his men were driven back in defeat. 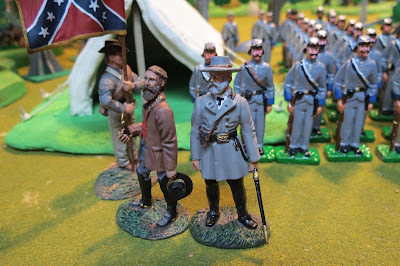 General Lee suffered great losses at the Battle of Gettysburg, and following the battle he retreated back in to Virginia; he would never lead his army on an invasion again. 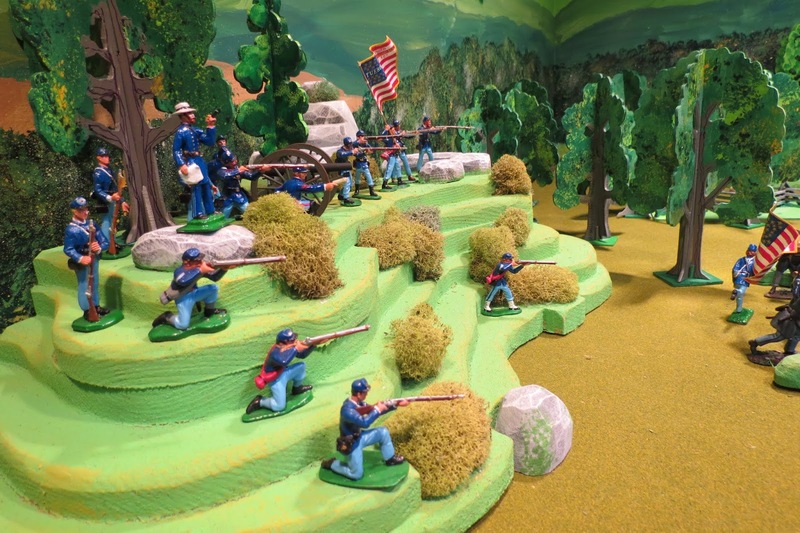 That's where toy soldiers took me. 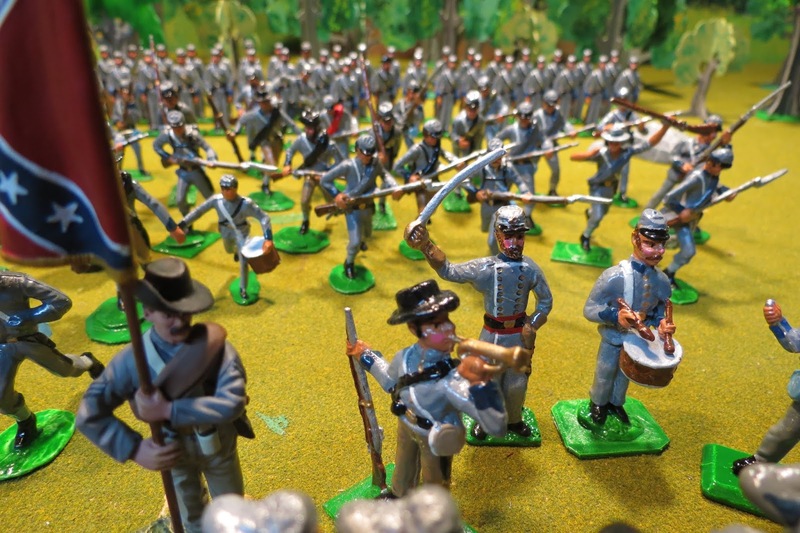 Who knows where your imagination and your enjoyment toy soldiers will take you. 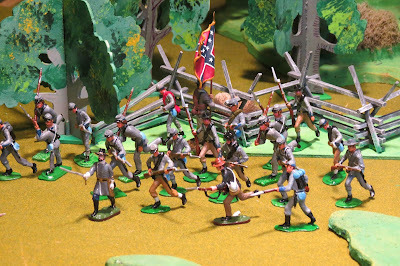 Of the 200 soldiers on my battle table, all but 33 were made and painted by me. I also made the rocks and ridges, the hills, the larger tents, and all of the trees. You can see a video of me making the soldiers here, and making the trees here. 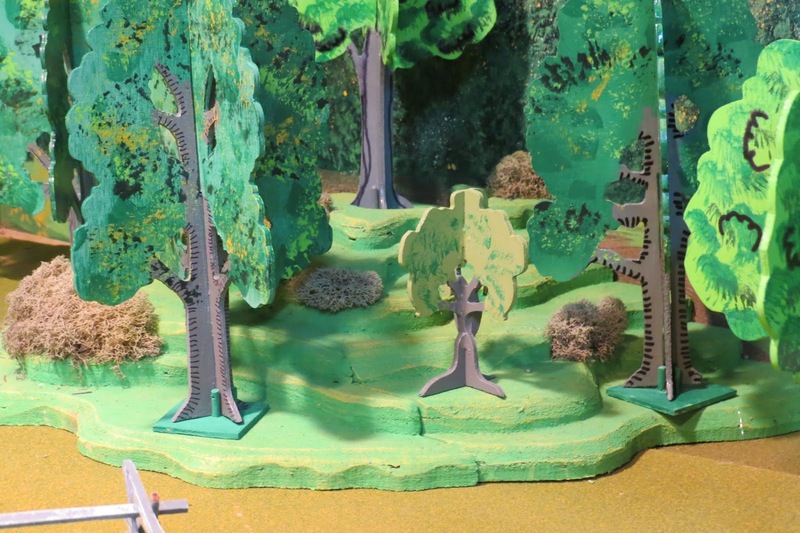 You too, can find ways to make your own scenery...just use your imagination. I'm no Robert Louis Stevenson or a Bruce Catton, but I did write and illustrate a coloring book. 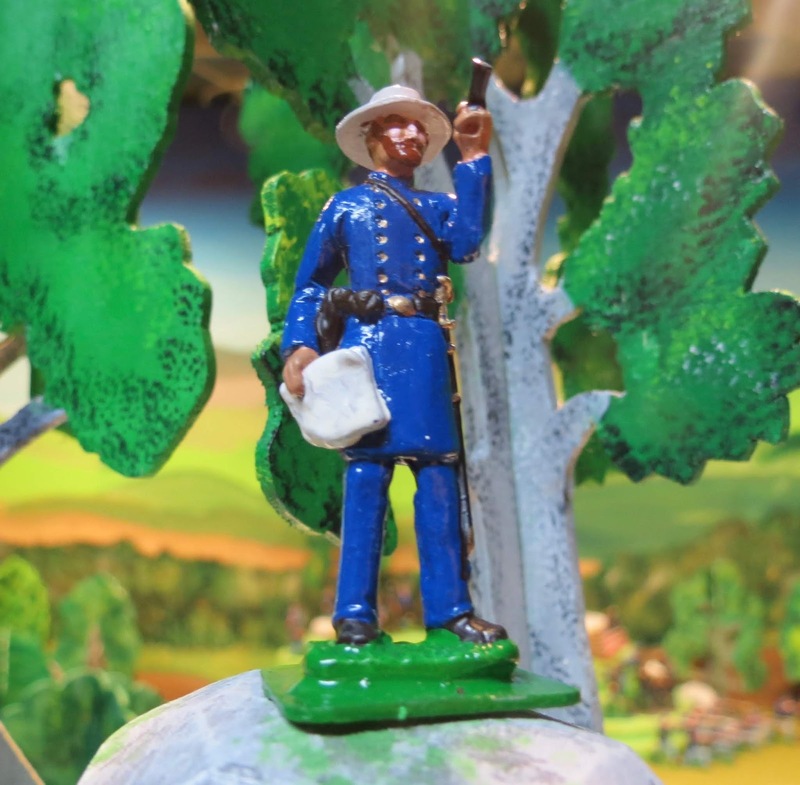 It tells, in rhyme, the story of the battle of Antietam. 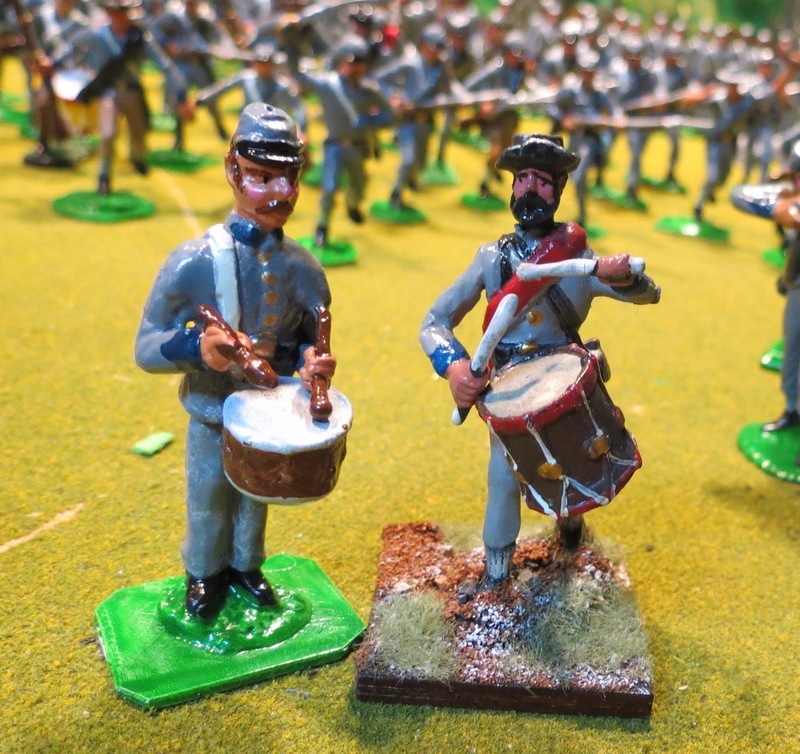 I have only a few left, but if you have your parent contact me, I'll be happy to send you one, especially if they include a picture of one of your toy soldier battles! 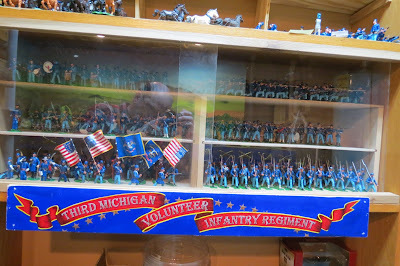 My email address is: museumofamerica@myactv.net. 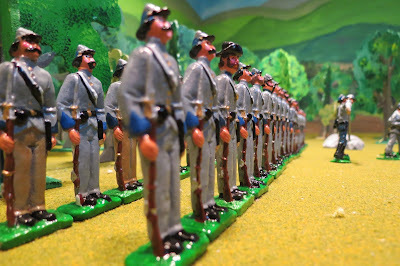 Third South Carolina Infantry Battalion, reporting for duty. 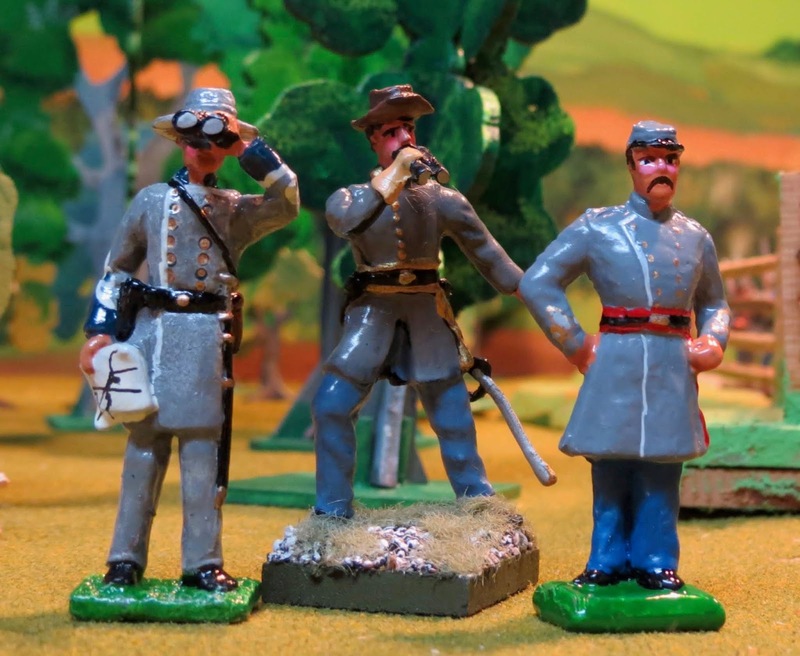 "In recent years we seem to have lost the knack for making toys. Toys, in a direct and unembarrassed manner, give us a special kind of pleasure, a pleasure different from the admiration we may feel for a perfect copy of the real thing." 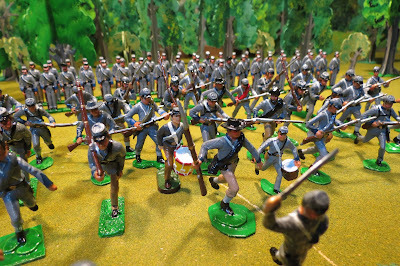 Mine are not miniatures, but toys...toy soldiers. 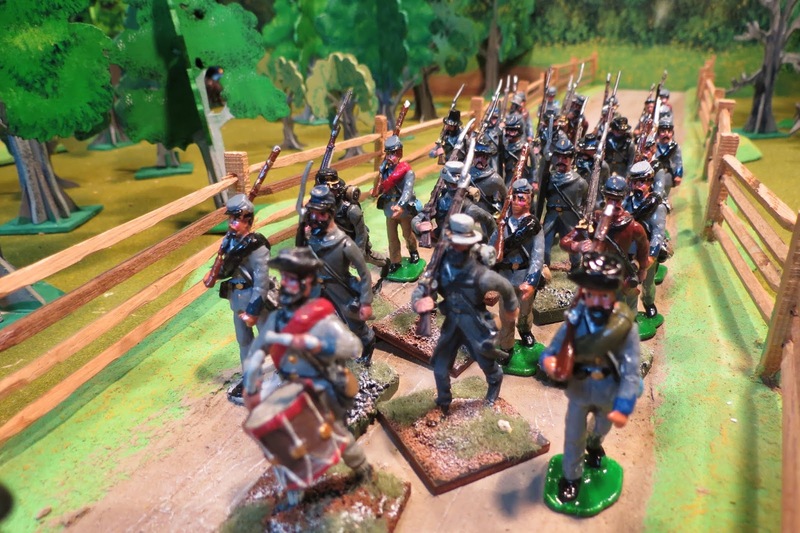 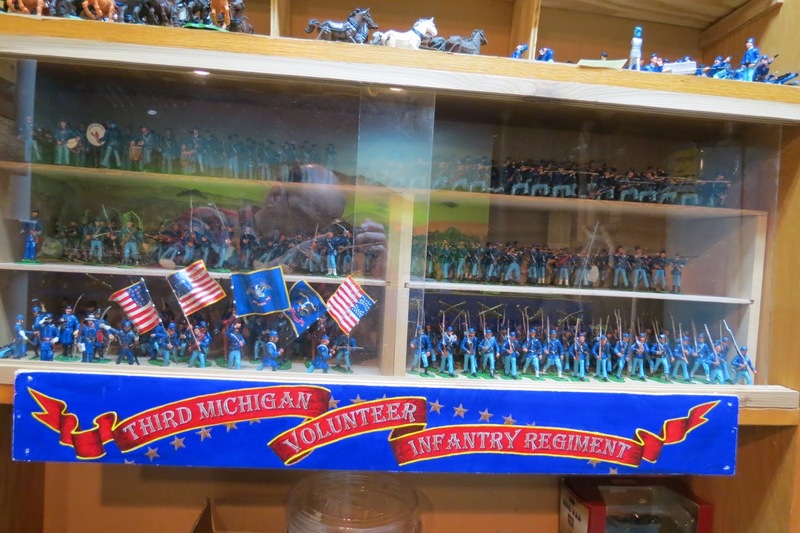 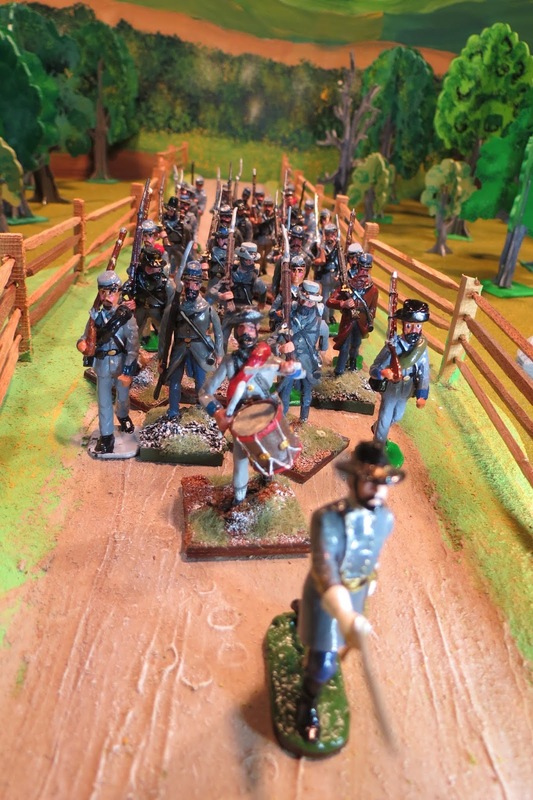 In 2012 I completed a project that was nineteen years in the making - the Third Michigan Volunteer Infantry Regiment in 54mm. (which can be seen here). In March of that year I started my second large project - the Third South Carolina Infantry Battalion. 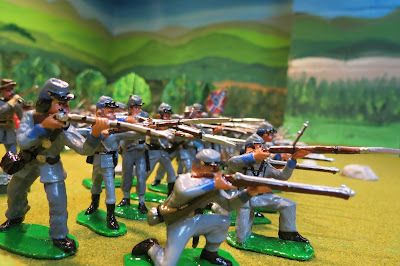 I selected this unit as they were the opponents of the Third Michigan during the Peach Orchard action on the second day of the Battle of Gettysburg. At the Peach Orchard the 287 men from Michigan fought the 202 from the Palmetto state. 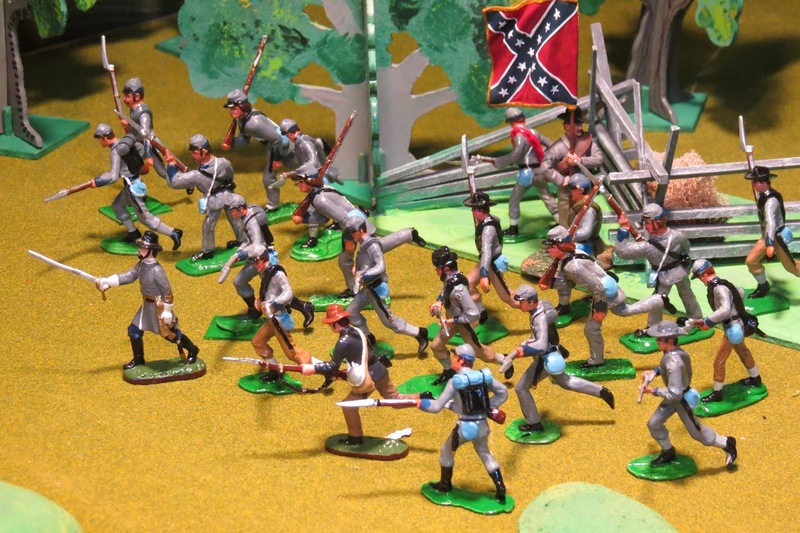 This meant the casting and painting of nearly 500 figures. 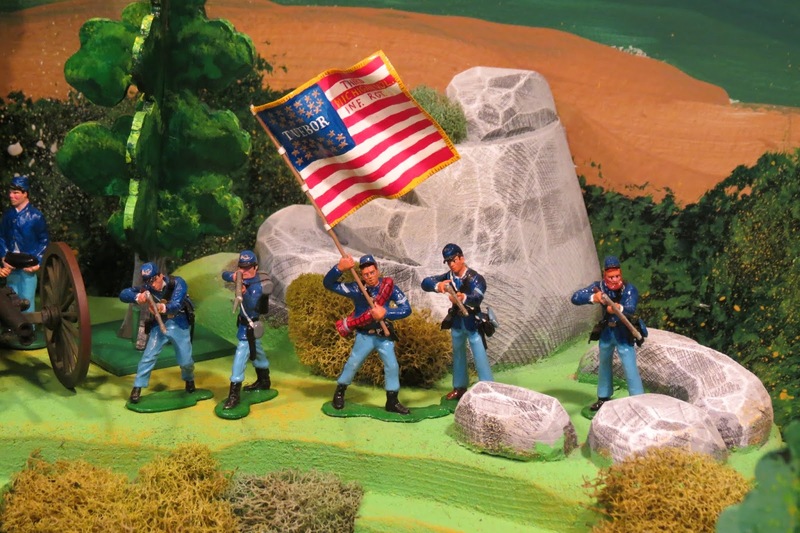 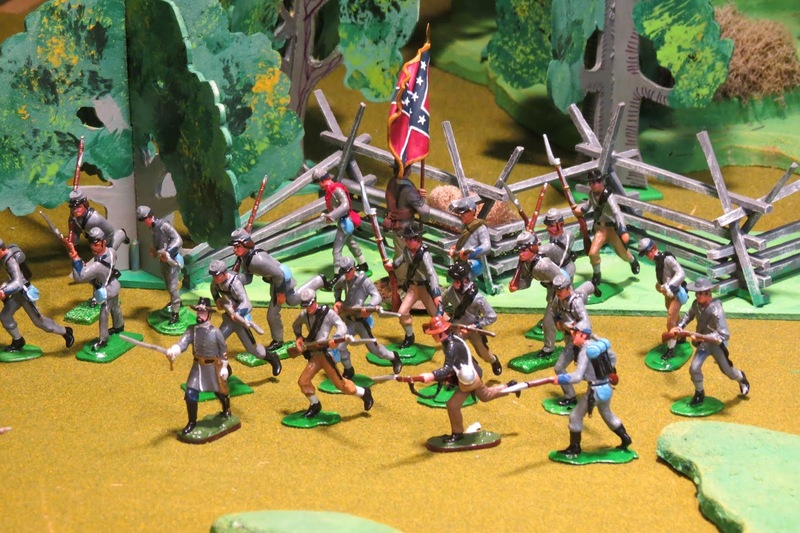 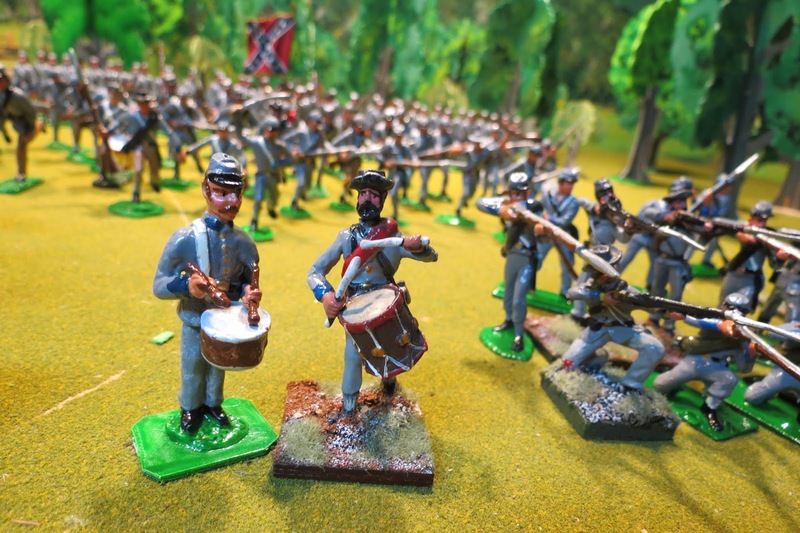 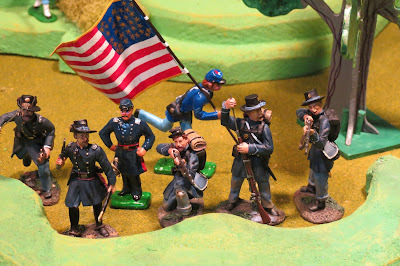 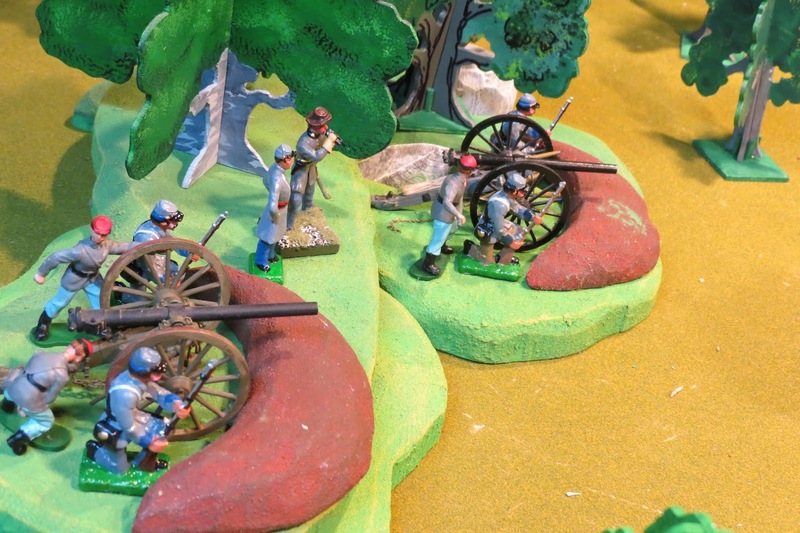 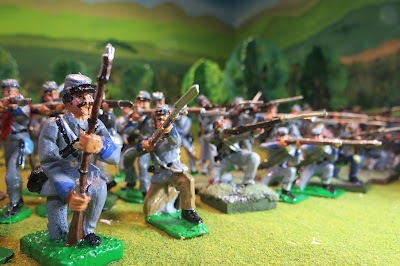 The South Carolina battalion took less time than the Third Michigan as none of the figures were custom made by me; instead, they were all cast from commercially available molds. 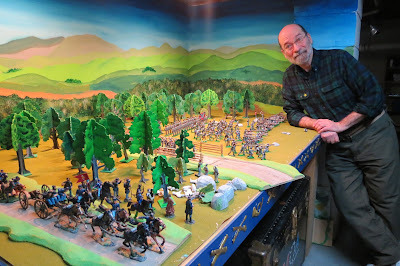 I was determined that this would not be another decades-long project. This afternoon the project came to an end, and here, for you, is the result. Presented with minimal narrative and targeted to my favorite audience for this blog...children. 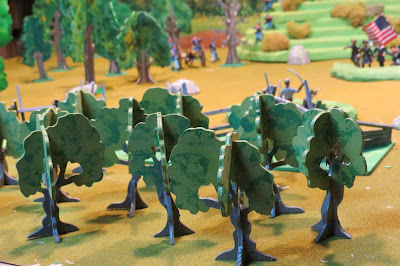 I hope you find the delight in these toys that Mr. Eames was talking about all those years ago. Ready for action are the 202 men of the Third South Carolina Infantry Battalion. This major leading the way, and the drummer behind him, are two of the 34 store-bought figures that I acquired simply to speed up the completion of this undertaking. The battle flag is held aloft by another store-bought soldier - a W. Britain flag bearer. The figures on bases like that in the center of this firing line are those that were not made by me, but purchased from another source. 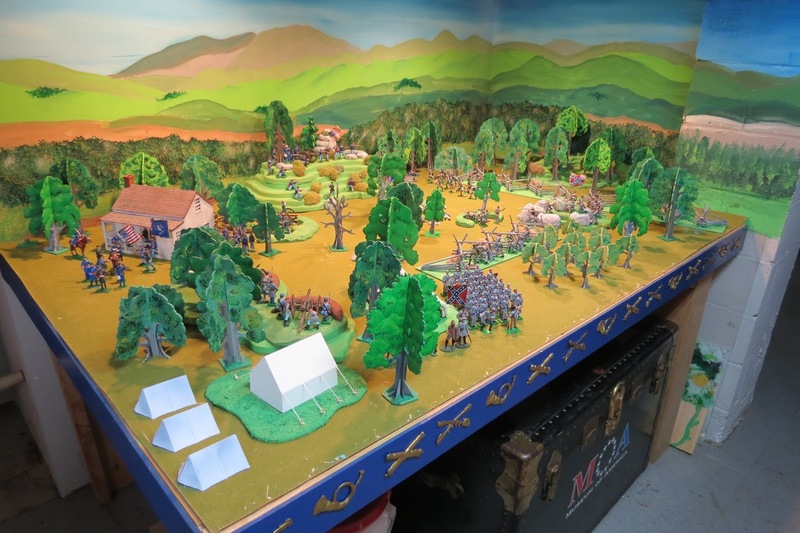 In this I cheated a little simply to get the project finished. 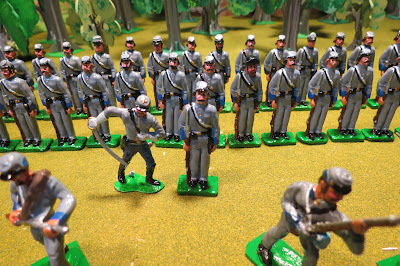 Many may recognize a casting from an old Marx-style mold. 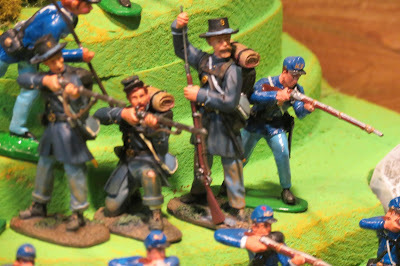 The figure in the center was one of those that were not cast and painted by me, but rather, purchased on ebay.